This week I have been working on a new website project, using Microsoft Visual Studio 2008 for the first time. If you are coming to Studio 2008 from Studio 2005, everything seems similar, and you shoud have no problems getting to grips. The IDE seems just as quick as 2005, and getting started on the website was a doddle. To do this, you must first enable script debugging from IE. 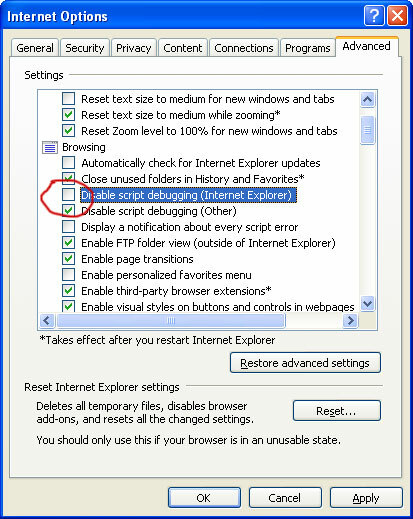 In IE, Click Tools, Options, Advanced, then untick the entry Disable script debugging (Internet Explorer) - see photo.